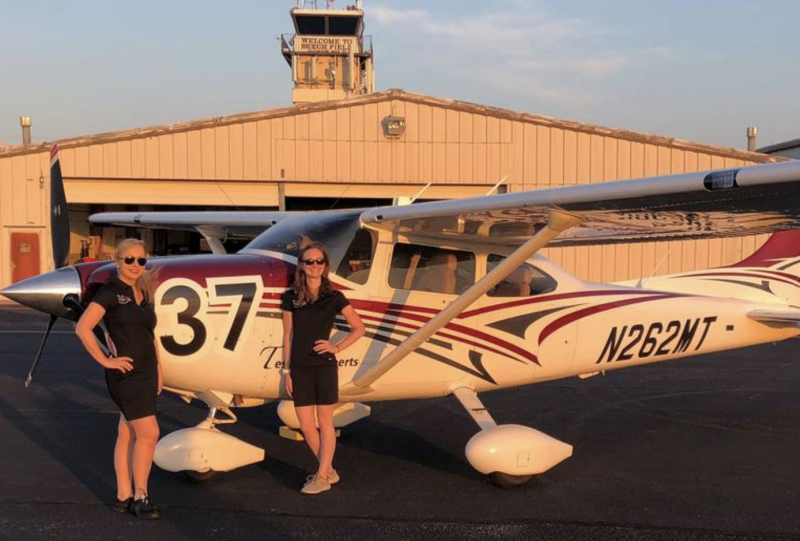 The patio at Stearman Bar & Grill is where Women’s Air Racers Tessa Roberts and Emmy Dillon will be presenting for the Wichita Aero Club on August 23. 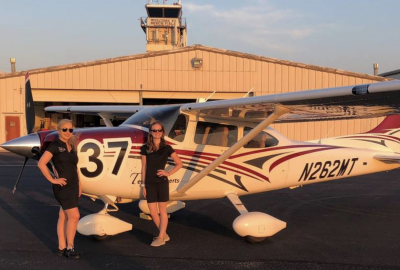 Roberts, Bombardier section chief of field support engineering, and Dillon, a human factors engineer for Garmin’s aviation systems division, make up the Kansas team which competed against 54 other teams in the 42nd women’s Air Race Classic in mid-July. They flew a Cessna 182 — call sign, Classic 37 — owned by Textron Aviation Employees Flying Club. The current race routes are approximately 2,400 statute miles in length, and the contestants are given four days, flying VFR in daylight hours, to reach the terminus. Each airplane is assigned a handicap speed – and the goal is to have the actual ground speed be as far over the handicap speed as possible. The pilots are thus given the leeway to play the elements, holding out for better weather, winds, etc. The objective is to fly the “perfect” cross-country. In this type of race, the official standings cannot be released until the final entrant has crossed the finish line. Actually, the last arrival can be the winner. The races in the 1930s flew shorter legs and made more stops than the current races. Races in the 1980s through 2000 flew longer legs of 350 to 400 miles. Now the legs are 280 to 320 statute miles, with between seven and nine control stops designated for either landing or flyby for timing. The races are open to all women with fixed wing airplanes from 100 to 570 horsepower. The earliest races were flown solo, in the single or two seat airplanes available at that time. Today a team consists of a pilot and copilot, with additional teammates to spread out the workload and add to the fun. Reserve your seats early to make sure there’s a spot on the lovely patio for you. And put it on your calendar, too. Download your save the date calendar event by clicking here!